This past weekend was the essence of what Adventures of a Funatical Runner is all about – combining races with trips to interesting places I might not otherwise visit, seeing the sights and enjoying new experiences. 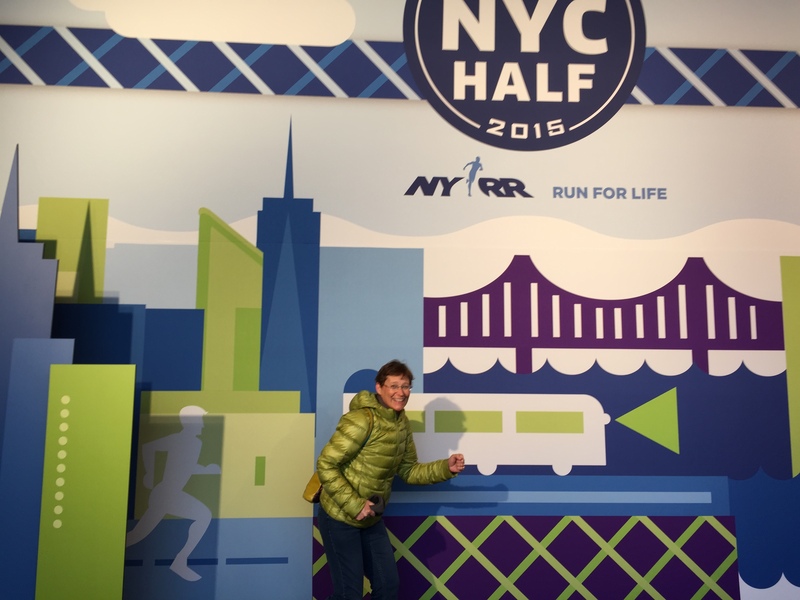 I traveled to New York City to run the New York City Half Marathon. My husband came with me, which made the trip much more enjoyable. We got to NYC a couple of days before the race so that I had time to have some fun before race day. I like to see obscure sights that fewer people visit. Between visiting one of NYC’s numerous museums and seeing a play, we stopped in the Expo to pick up my bib. Then we headed off the beaten path. 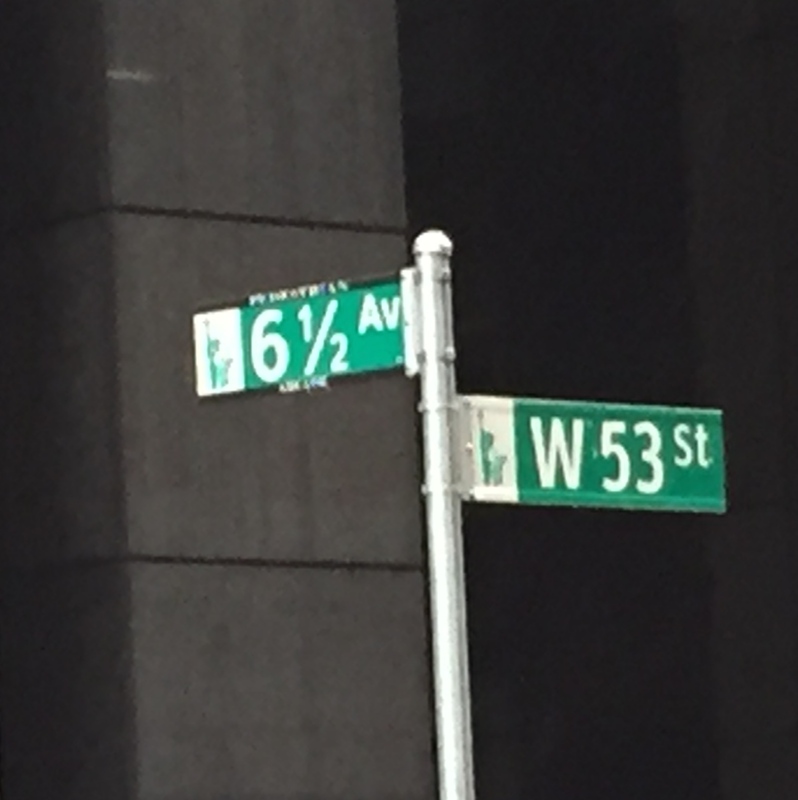 We stopped in the Waldorf-Astoria Hotel to see Cole Porter’s piano on display in the lobby and then wandered over to look for 6 1/2 Avenue (one of several 1/2 Streets in the city). I have never seen a 1/2 Street before; it looked more like a pedestrian walkway between buildings than a real street. Then we headed to Strand Book Store, an independent bookstore in the East Village area that sells new, used, and rare books. Their motto is “18 miles of books” and I don’t think that is an overstatement. Strand even rents books for theater sets, photo shoots, and staging model apartments. Next to running, my favorite activity is reading – interesting since reading is the antithesis of running. One activity is about movement; the other, not so much. I had to limit how long I shopped in Strand Book Store. It didn’t take much time for me to end up with an arm load of books. Good thing I stopped looking at books or we would have had to stop in Times Square to buy another suitcase to carry them home. 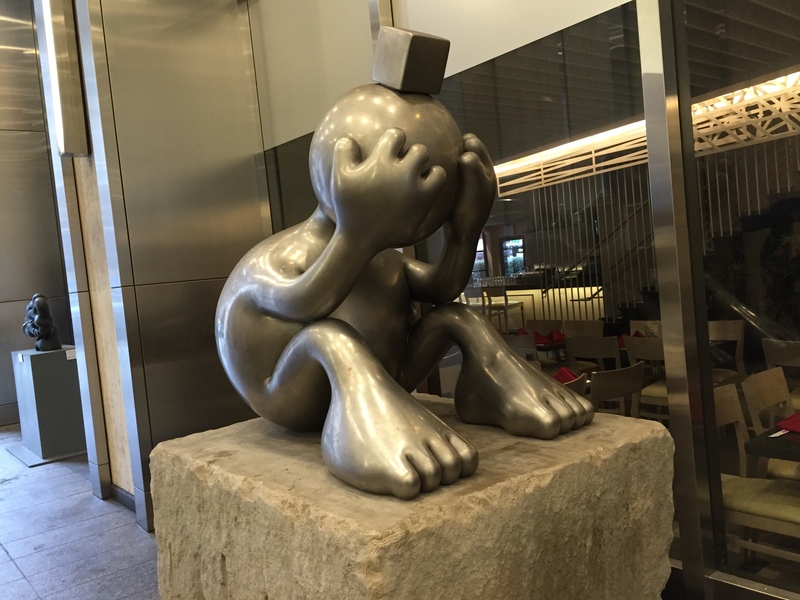 The streets of New York and even the subway stations are full of art but I don’t think most people notice. Everyone seemed in a big hurry to get somewhere. 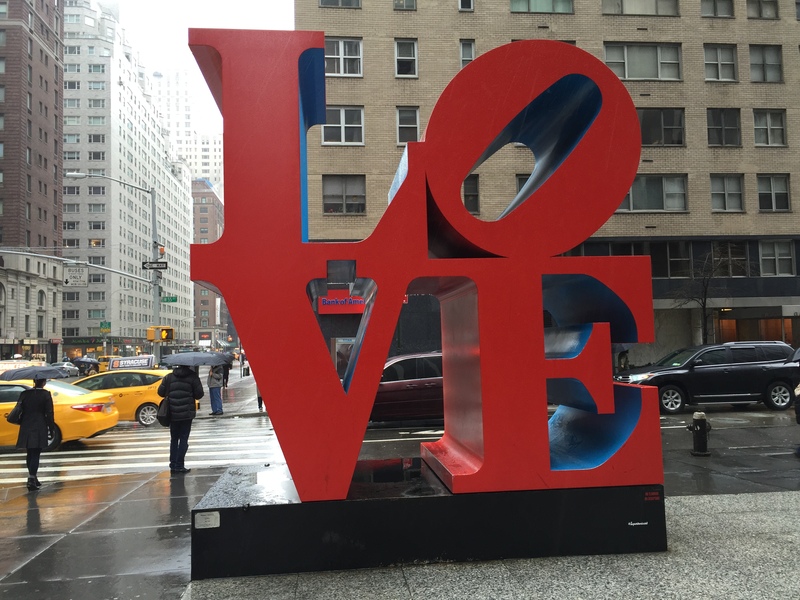 We found a Love sculpture by Robert Indiana (the original is in Indianapolis, IN but there are other versions all over the world including one that I photographed in Tokyo). On another corner was a Hope sculpture by the same artist. We came across an arcade with several interesting sculptures on our way to Tiffany’s to get a new necklace for my Nike Women’s Half Marathon medal charm. 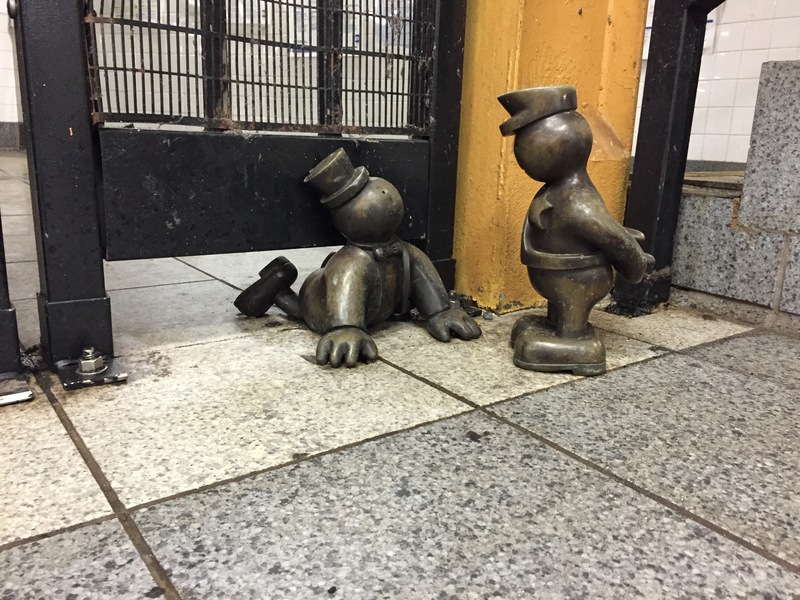 But my favorite sculptures were a series of small bronze figures that were placed throughout the 14th St. and 8th Ave. station. NYC is heaven for any foodie. They have every kind of restaurant you can want. On Saturday I needed to carb load for the race so we popped into Patsy’s Italian Restaurant, a family-owned restaurant opened in 1944. The restaurant is around the corner from Carnegie Hall and has been a favorite spot for many celebrities, both past and present including Frank Sinatra, Rosemary Clooney (George’s aunt), and the entire cast of “The Sopranos”. We heard opera singing from the upstairs dining room and learned that the Mario Lanza Society was holding their quarterly luncheon at Patsy’s. (Mario was a famous tenor in the late 40s/early 50s, long before the Three Tenors hit the scene.) The opera singers were the entertainment for the luncheon. When Sunday morning arrived, I was ready to get out and run. That was the real reason I was there. As I made my way to my corral, I noticed a large dog statue on the other side of the fencing. I found a gap in the fence and ran down to check it out. 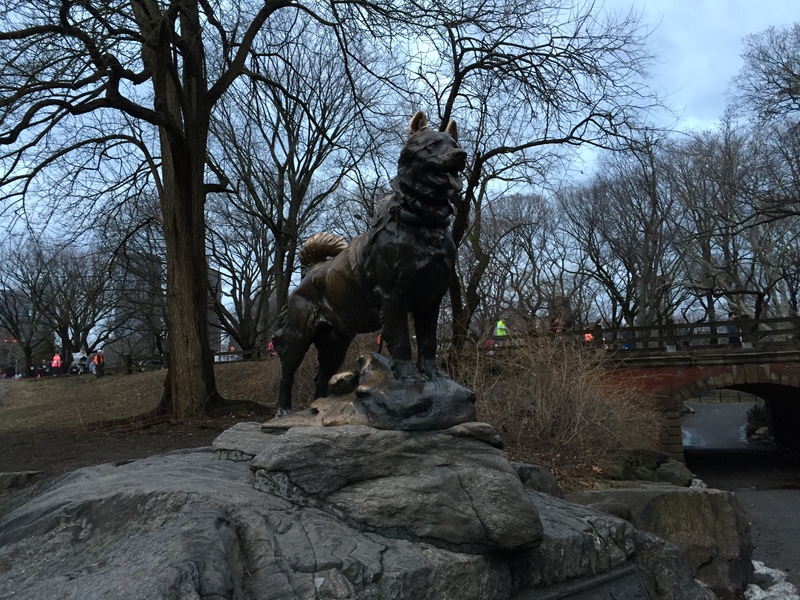 The statue was of Balto, a Siberian Husky who led a sled dog team on the final leg of the 1925 run to Nome, Alaska with antitoxin needed to combat a diphtheria outbreak. The run is commemorated each year by the Iditarod Sled Dog Race. Balto statue – The inscription at the bottom reads: “Dedicated to the indomitable spirit of the sled dogs that relayed antitoxin six hundred miles over rough ice, across treacherous waters, through Arctic blizzards from Nenana to the relief of stricken Nome in the Winter of 1925. It was chilly as we waited in the corrals. I don’t complain much about cold weather. Cold weather is much better running weather for me and my Transverse Myelitis. Many of the runners were worried about being prepared for the race. The extreme winter weather had disrupted much of their training. I felt pretty confident about the race; I had completed both a full marathon and a half marathon within the prior 3 weeks. I probably should have been taking more time off instead of running another half marathon. Our corral started over 40 minutes after the start for the elite runners. The cooler weather worked in their favor too; they were really moving. I wasn’t even at the 5km point when the men’s winner finished the race! There was plenty to see when we finally started running. Central Park has many ponds and statues, more than I had time to stop and photograph. There was one, though, that grabbed my attention. 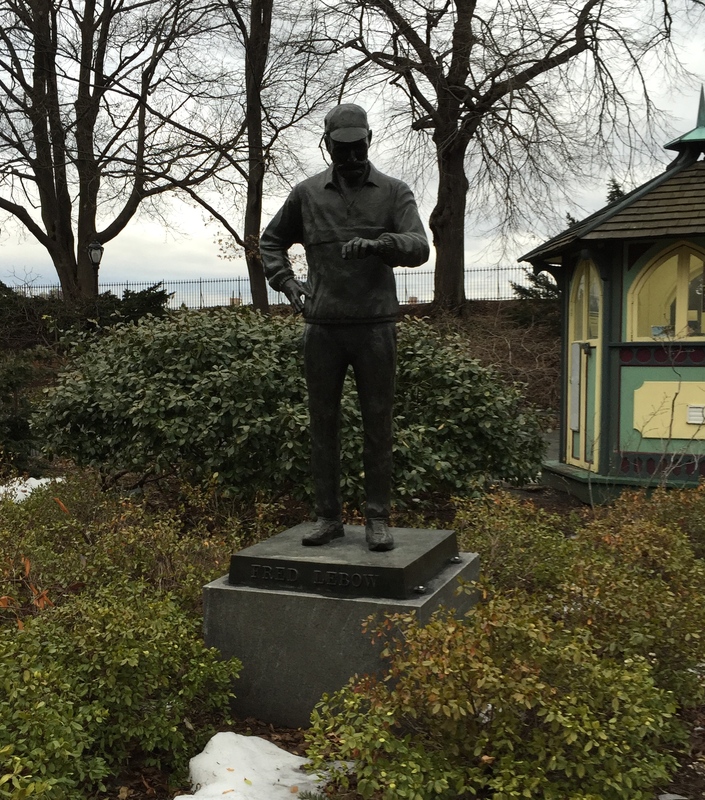 It was the statue of the late Fred Lebow, a runner, president for 20 years of the New York Road Runners Club, and founder of the New York City Marathon. It was a real treat to see. The statue is on East Park Drive but each year for the Marathon, they temporarily move it to a spot near the finish line on West Drive. Fred will always be part of the race he created. When we left the park, we were greeted by crowds of cheering spectators. It was exciting to run down 7th Avenue towards Time Square. As I ran, I looked at the architecture of the old buildings – the iron grill work, carved stone, and ornate glass – beautiful buildings with lots of character. We headed out 42nd Street towards the Hudson River where we followed West Side Highway down to Battery Park. It was windy along the river. I could see the remnants of old piers, some of which have been converted into parks and green spaces. The last part of the course took us through a tunnel before we emerged to make the last few turns to reach the finish line. It was a fun weekend and I enjoyed the race. Many people I know got PRs (personal records). I probably could have too but I spent a good bit of time taking pictures. There was so much to see along the course and I wanted to be able to share it with you. I need to go back and spend more time seeing the things I ran by. Maybe I need to run the New York City Marathon and see the rest of the sights. Hmmm. I didn’t have time to see everything that I had on my list of obscure sights. Might need to plan another trip soon! 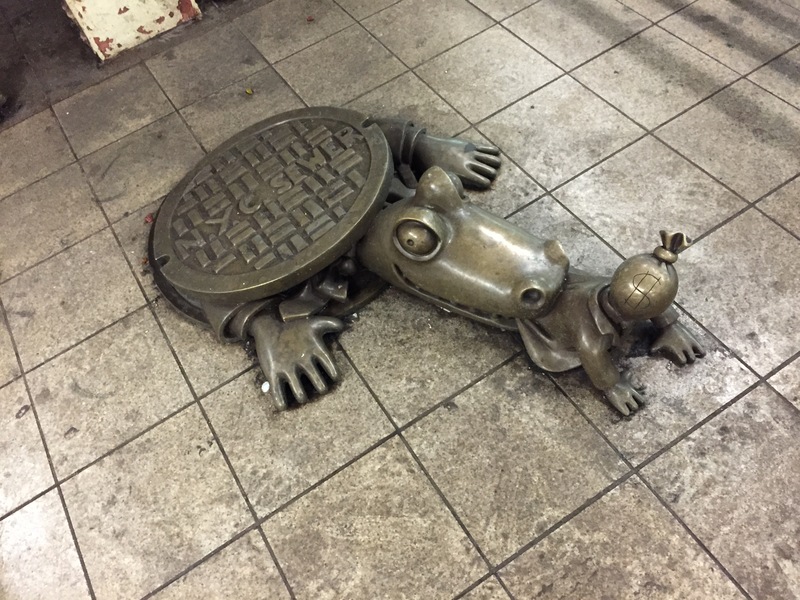 There were many bronzes in that subway stop. I took as many pictures as I could. Yes, I saw the bald eagle in its snow-covered nest. Dedicated parent! Cheers!